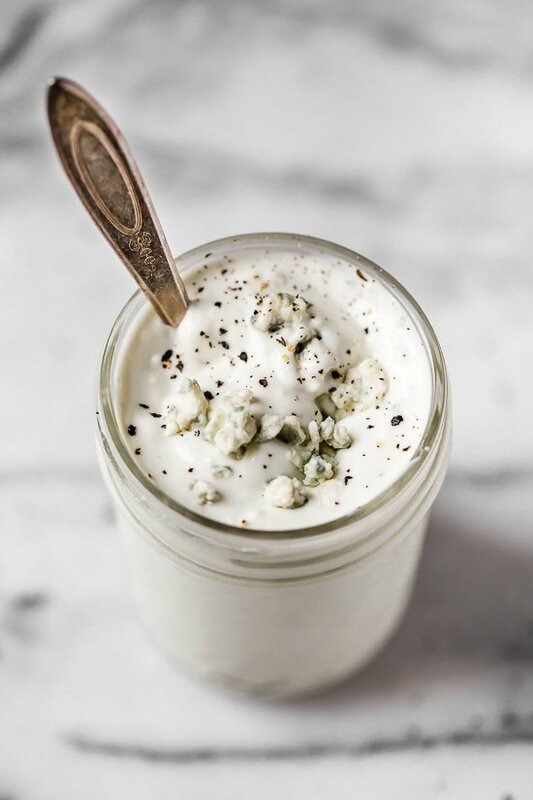 This simple, light, homemade Blue Cheese Dressing is made with Greek yogurt, blue cheese, lemon juice, mayonnaise and seasoning. Nothing beats the flavor of homemade salad dressing. Making your own salad dressing gives you control of what ingredients go into it. Serve this with a wedge of iceberg lettuce, as a dip for skinny buffalo wings or one of my favorite ways to enjoy this is on a roast beef sandwich on a good whole wheat crusty bread with arugula. To store leftovers: Keep in an airtight container in the refrigerator for up to 5 days. Made this today for the first time to go with your buffalo chicken lettuce wraps and the Buffalo Chicken Egg Rolls (yes…..I having a huge craving for buffalo wings). I usually hate low fat dressing and usually splurge on full fat dressings since I use so little on my salads, but this does not taste “diety” at all. I did add about 3 tablespoons of water since it was a little thicker then I wanted. I am a huge blue cheese dressing fan and This will be a regular staple in my fridge. Love how the lemon gave it such a fresh after taste. I think I actually like it better then store bought full fat versions I’ve tried. I especially like how quick it was to make and that I didn’t need to get out a blender or food processor. This is SO easy and is very authentic tasting. 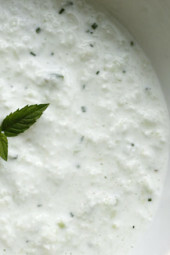 My husband loves his blue cheese dressing and this version he really enjoys and helps him keep his WW points low! This is so spectacular! It is my new go to dressing and it’s making me eat more salad. As for the question about making it thinner, I added some Ken’s lite italian dressing to mine and it gave it the thinner consistency and kept it low points and super flavorful! Thanks, Gina for all of your recipes! This is DELICIOUS! I would have liked it a little thinner. Do you have any suggestion to keep the flavor but make it thinner? Should I just add some water? I like this better that the full fat variety of blue cheese dressing. This dressing is delicious! Just had chicken tenders in Franks Hot Sauce with celery sticks while watching college football. All the taste without the Points. Highly recommended. Thank you !!! OMG. . . Absolutely delicious. Can’t tell it is made from Greek Yogurt! How’d you do that Gina?!?!? I have made this twice this week as we are eating a ton of salad, and watching our calorie consumption. 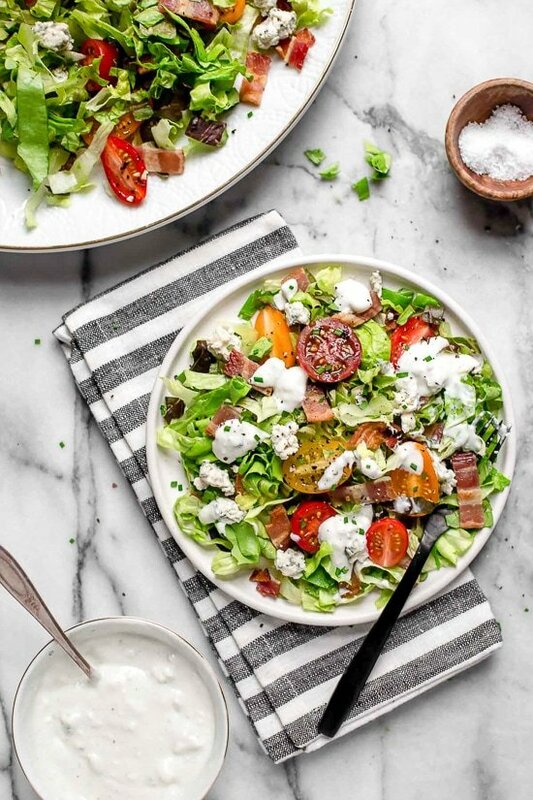 This is so much better than store-bought blue cheese dressing, and I love knowing exactly what is in it! Thanks for such great recipes. I absolutely love blue cheese dressing and am very picky so it’s hard to impress me with a good recipe. This is probably the best homemade recipe I’ve tried! Thanks again for a great recipe! This is so delish! Can you tell me how many freestyle points a serving is? i LOVE this dressing! It’s great on your buffalo chicken tenders, it’s my go-to on baked potatoes, and it also works on so many other things, including the buffalo turkey burger I had for lunch today. I always have a container of this in my fridge since I first saw the recipe a couple of months ago. 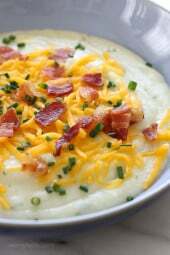 How fantastic to find a recipe that doesn’t destroy the dressing by adding sweeteners! Sugar in this is bad enough but artificial sweeteners make it inedible (for me, anyway). 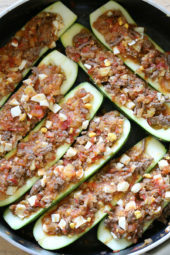 I made these and served them on a bed of zoodles (microwaved with a little olive oil, S&P). What a hit! My boyfriend loved them, as did I. I subbed sriracha for the hot sauce, because that’s what I had, and they were perfect. Thank you for sharing this recipe! I feel really good about eating and serving these. Woops! This comment was for the chicken meatballs, but I also made the blue cheese dressing to serve them with, and it, too was a delicious complement. Very easy dinner tonight! Gina, I have to say this is my absolute favorite and has been a life saver for me. I eat it almost every afternoon. I dip roasted cauliflower in 1 T. of it for a snack. This has been my Weight Watcher trick for a while now. The cauliflower fills me up and the blue cheese dressing makes me happy! Thanks so much! I think it’s better than regular blue cheese dressing. You’re the best! I made this last night and had it with homemade buffalo chicken tenders and celery. Delicious! So much better than any low fat store bought version! Hello, can I use something else besides mayo? Sounds so good!!!! Has anyone ever discovered the shelf life?? Love this, but don't want to waste it or have to keep making it every few days. This sounds delicious; I love blue cheese. How long do you think it would keep in the fridge? Made this tonight to go with your Buffalo Cauliflower Bites and it was awesome! Forgot to buy a lemon at the grocery store, but I just doubled the vinegar and it was still delish. I made this last night to go with cobb salad. It is so good! Thank you. How long will this dressing last once it's made? What can I substitute for the Greek yogurt? I'm allergic to Greek yogurt, I can eat regular yogurt though! Do you think a fat-free sour cream would do it?